Nginx (engine-x) is a open source and high performance HTTP server, reverse proxy and IMAP/POP3 proxy server. The outstanding features of Nginx are: stability, rich feature set, simple configuration and low resource consumption. Nginx is being used by some of the largest websites on the internet and is gaining more and more popularity in the webmaster community. This tutorials shows how to build a nginx .deb package for Ubuntu 15.04 from source that has Google pagespeed module compiled in. Run nginx -V to see the ngx_pagespeed was builted with nginx. The nginx web server there is a stable and fast open source http server that supports a variety of modules for optimization. One of these modules is the 'PageSpeed module' which is developed by google. Unlike apache, nginx modules are not dynamically loadable, so you have to select the desired modules before you build the nginx package. It's being discontinued in a few months. Hi Matthew, you seem to mix up the googe pagespeed service with the google pagespeed module for nginx. the google pagespeed services gets discontinued in favor of the pagespeed module. the above tutorial is about compiling nginx with the pagespeed module, it is not about the pagespeed service. It's works with ISPConfig 3? I search for the /etc/nginx/sites-* folders and do not see. No, this guide is not compatible with ISPConfig. 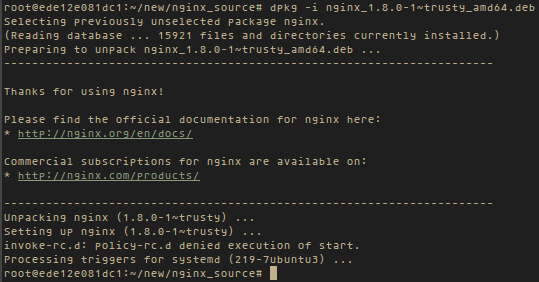 I tried this one, to update nginx to the latest version compiled with ngx_pagespeed. Unfortunately, I had issues with my ISPCONFIG installation. Can you please provide some help for those who already have nginx & ispconfig installed?